Spring means love songs. Birds twitter, bees buzz, young men act, well, like idiots. Young men will do most anything to show off for young women. That's why young men win more Darwin Awards. Oops, got off track there for a minute. So it's spring and the trees are greening up, wildflowers blooming and the pond is waking up. There are new green leaves from irises breaking the water's surface and maybe, just maybe, the beginnings of water lily pads. Spring storms salt and pepper our lives. We plant our veggie gardens with optimism, put in bedding plants in the flower gardens, check the perennials for new growth and settle in to watch our gardens, both water and soil grow, flower and prosper. But what is that awful noise? In the midst of our contentment, a phalanx of jet planes flies over or maybe it's 200 freight trains making a new path past the back door. Just what is that awful noise? It starts at dusk and sounds like the biggest electric motor in the world about to burn out. It is coming from near the pond. Nobody for blocks around can sleep, TV's are 5 notches up in the sound department, even kids have to scream to be heard. Wife sends husband out back to find out how to stop the noise. He can't find a thing. Next morning they check the pond and find strings of jelly with black dots in it in the pond. Aha, toads have been visiting. No, it's not frogs. They go ribbit, ribbit, are smooth and green. Their eggs black dots in a clump of jelly, not strings of it. Toads are brown and bumpy and you already know what the eggs looks like and the noises they make. Check at dusk tonight. You will see those brown and bumpy toads in couples near the pond, one atop the other singing their glorious love songs. The noise lasts a couple of weeks. The toads eat millions of mosquitoes and are great little critters to have around. They will live under rocks, flower pots and leaves. Rejoice in the noise. It is but the love song of toads and only a privileged few get to hear it. Yes, the vernal equinox is upon us, the pond is waking up from winter. In most of the northern states, the snow has been replaced with brown slush. In the warmer South, plants are sprouting, the pond rushes are greening up and signs of long asleep pond life is awakening. When the last danger of frost is over, put your pump back in the pond and plug it in. 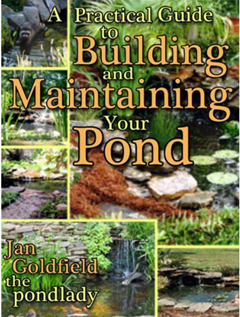 Be sure your pond is clear of sludge and has at least 1 bunch of submerged vegetation per square foot of surface area. When your sleeping goldfish wake up, they will be hungry. Do not feed them now. Do not feed them at all. The first thing the pond owner will notice is the odd croak and singing. Toads are waking up to find mates and fill the pond with long strings of toad eggs that will hatch into tiny toads. Most folks hate them because they are a bit loud in their nightly mating songs, but welcome them to your yard. You have invited them in to eat mosquitoes and other bugs. Leave a few rocks around for them to sleep under and watch for their long tongues to flicker out for the nearest sleepy fly or mosquito. Frogs are not far behind the toads. The frogs don't make quite as much noise, making a 'ribbet ribbet' sound while seeking a ladylove. If you are lucky, you will soon see in the pond a blob of jelly filled with little black dots. Toad eggs are long strings of jelly; frog eggs are blobs. Frog tadpoles will hatch and grow into tadpoles. Hope that yours will evade predators and grow into smooth green frogs. It takes a couple of years for a tadpole to become a frog, so patience is the key. If frogs get big enough, they will eat your smallest fish, but most pond keepers think that's a fine trade off for a critter that eats its weight in biting bugs. Reeds are usually the first plants to green up. The horsetail or scouring rush is growing already. So are the sedges. New cyprus is peaking through the old brown dead growth. Remove the old growth when the new starts growing. You don't need to fertilize any plants. The fish do that for you. Water lilies pads usually reach the top of the pond by May here in the South. Hardy lilies have been in my pond all winter and are already showing signs of growth with tiny pads heading for the surface. When the first pad reaches the surface, I will fertilize them with an aquatic tab fertilizer. If you did not separate yours last fall, do it now. Plant each corm in a separate pot and put it in the bottom of of the pond. You can give them to your friends when they grow to the top. Tropical water lilies are slower to grow and want the days to be warmer and longer. I have their pots on the very bottom of the pond. If I see no growth by mid April, I check to see if the corms are firm. If they are mushy, they are dead and must go to the compost heap. About half of them are viable and will be blooming in their glory by June. I feed them as well, when the pads reach the surface of the water. Our ponds are a focal point in our gardens. Soon they will reclaim that spot in our lives as well. Sit by your pond, sip your tea and relax after work. 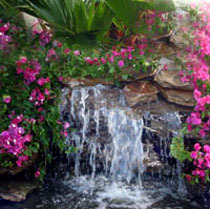 Let your worries be washed away by the sound of your waterfall. 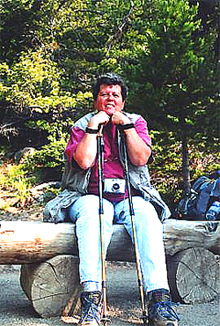 A few years ago I had occasion to travel to Northeastern Tennessee to a place called Roan Mountain. Surging from Roan Mountain is the Doe River. I wish to take you there. Would you come along? Come with me through the forest down into the Doe River gorge. The ground sinks under our feet from the hundreds of years of nature returning to itself to provide for itself and for us, although we are one. Some of the walking is difficult--the vines get in our way and the partially decomposed fallen trees block the path we pick out. Feel the majesty of what once was and will be again. Sometimes I stand on the fallen trunk and feel the majesty of what once was and will be again. I giggle and want to swing from the vines and yell mightily as I jump into the river. I restrain myself because the river is only a few inches deep--I can see the stones and silt on the bottom now. The bank drops off quickly so the last step will be a long one with no real assurance that the bottom is really the bottom. You reach out your hand to steady me as I make that last step--with a grin and much faith, I let go and step into Doe River. The water is cold initially. It rushes around my jeans clad leg almost up to my knees. I am laughing aloud now. I begin walking in the water, feeling my legs getting used to the coolness, letting my feet find the stones, the soft bottom, the millions of years of Doe River searching for the sea. I reach down and get one of the stones, rubbed smooth from thousands of miles of rolling down and down, for years of being soothed by the river, being slowly returned to the soil whence it came. "You are now in the water with me, walking gingerly and wondering if we can keep our footing. We walk toward the rushing rapids upstream, hopping up on large boulders occasionally to survey our progress and watch the water eddy around the boulders...."
You are now in the water with me, walking gingerly and wondering if we can keep our footing. 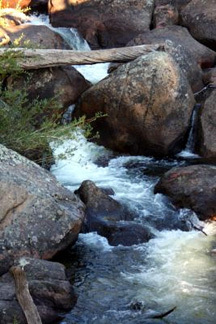 We walk toward the rushing rapids upstream, hopping up on large boulders occasionally to survey our progress and watch the water eddy around the boulders. It makes sounds and paths that change each time we take our eyes away. The smells of the woods, the water, the rocks, the trees, the plants are overwhelming in their richness, fecundity, the sounds are profound, talking to us of journeys it has traveled, of promises to us. And we know that those are promises that will never be broken. As we make our way closer to the waterfalls, the water reaches our knees. I reach down again and divert the water, feeling it on my hands and arms. It splashes on my face and I, powerless to stop, splash some on you. We both laugh out loud, sit down and are surrounded by all of the feelings of the greenness around us. Tears stream down our faces mingling with the water from whence they came, the tears are a sign of the joy that is within us, joy from our sharing -- with each other and with Doe River and every river and all water that exists now or ever has. The water welcomes us and washes over us, we can drink and feel the clarity, taste the journeys it has taken, know that it will give us life and soothe our thirsty beings. We are refreshed in every way--our thirst is quenched. It is inside us and around us, now and tomorrow. Writers at The Sage Companion appreciate your comments. In fact, we look forward to your response to our words and ideas. Please let us know what you think. Simply use the form below. To enter your comment, just type. Your words will appear on this page the way you enter them here. Click here to see the rest of the form and add your .02 cents. I promise to use it only to send you THE SAGE SPECTATOR.